Picture from Poland, Žurawlów. 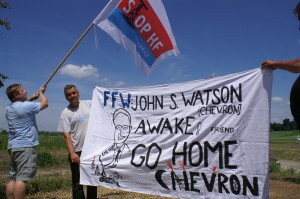 Czech Coalition STOP HF helps poland friends against illegal activity of Chevron. At 10.6.2015 plenary session of the European Parliament was on the agenda of the vote on the report, which relates to shale gas. On the initiative of the Czech MEP Mr Miroslav Poche was the report amendment, which meant a de facto moratorium on the extraction of shale gas. A proposal was adopted! Unfortunately, the report was eventually rejected as a whole, but the choice is a clear signal that some members respond to public demand and slowly leaning on the side of sustainable energy. All MEPs who voted for the moratorium, thank you! 39a: The EP believes that the use of hydraulic fracturing in the Union carries risks and negative impacts on the climate, the environment and public health, and that threatens the long- term goal of the EU decarbonisation; further considers that, in view of the fact that unconventional fuels may only limited help to meet future EU demand for energy, and due to the high investment costs and the costs of extraction does not hydraulic fracturing promising technology; therefore urgently requests the Member States not to authorize any new activity involving the exploration and exploitation of unconventional fuels in the EU until proven their safety for the environment, citizens and workers.